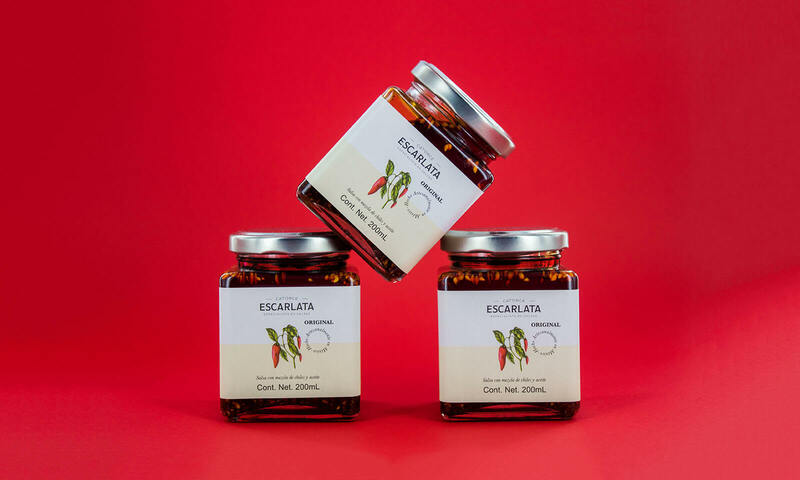 Escarlata is an spicy chili and oil sauce, made in Mexico in an artisanal manner. Given its natural origin, it is preservative and Trans Fat-free. To create an identity that displays the natural and artisanal attributes of the sauce in such a way that a future brand expansion is possible. The name "Escarlata" refers to the red color of the sauce, and provides a strong brand personality. For the logo, a vertical arrangement and weight variations between the characters was suggested. Given the brand expansion plans, a highly adaptable label layout was proposed. As a quick product differentiation strategy, we opted for neutral colors, contrary to what is commonly used by commercial brands. Illustrations of the ingredients evoke tradition. “Made in Mexico in an artisanal manner”.